I know everyone's busy at Christmas time but this project didn't take too long. Maybe you put it on your to-do list for next October or November so it's ready in time for Christmas. Once I had all my material it came together pretty quick. 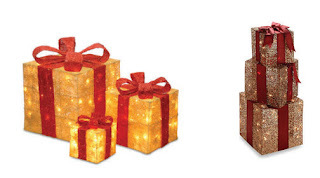 The gift boxes on the left are from Sears for $82.78. The boxes on the right are from Bed Bath & Beyond for $49.99. Wood for the frame ~ I had leftover pieces from another project. You do not have to make them this exact size. I came up with these measurement because I was using scrap pieces of wood. Once you have the frame of your boxes made start stapling the lights on. I used 2 boxes of the 100 ct string lights on my larger frame and 100 ct on my smaller box with plenty left over. 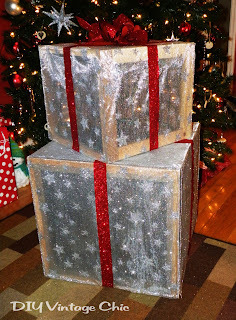 Next, cover the boxes with your fabric, stapling as you go along. I left the bottom side of my box open so I'm able to access my lights without having to remove everything. to put on top from the leftover ribbon. 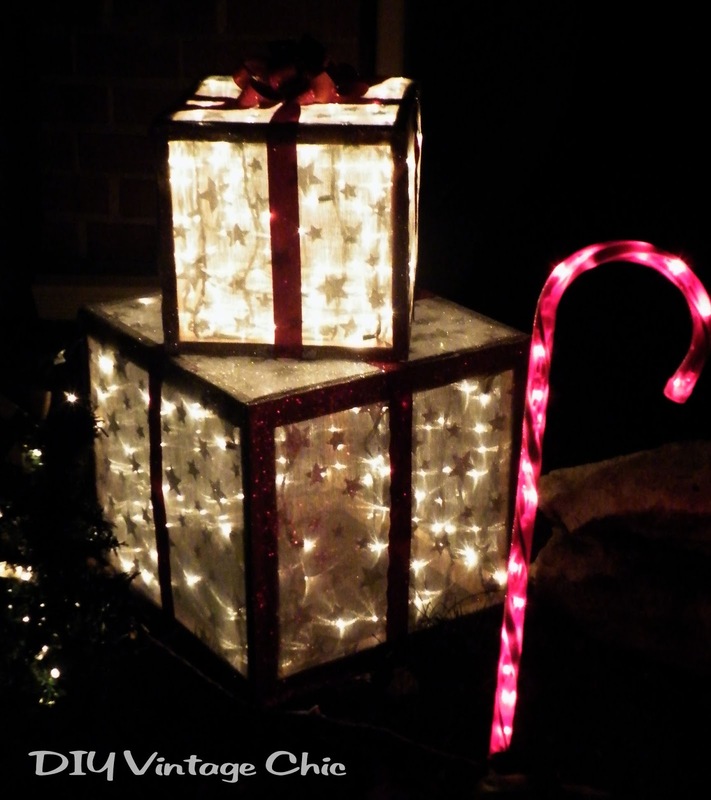 Set them outside, plug them in and enjoy the lights! 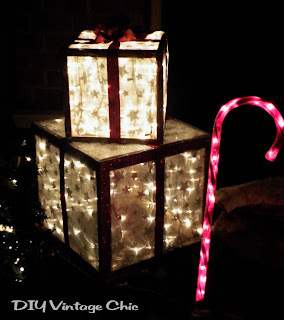 Linking up with: Savvy Southern Style's Wow Us Wednesday, Primp Junktion's Primp Your Stuff, The Thrifty Home's Penny Pinching Party, Crafty Spices' Wordless Wednesday, My Girlish Whims' Your Whims Wednesday, Embracing Change's Creative Inspiration Linky Party, The Brambleberry Cottage's Time Travel Thursday, Beyond the Picket Fence's Under $100 Linky Party, The Shabby Creek Cottage's Transformation Thursday, Bloom Designs' Linky Party, French Country Cottage's Feathered Nest Friday, Common Ground's Vintage Inspiration, Shabby Art Boutique's Shabbilicious Friday Link Party, Happy Hour Project's Happy Hour Friday. oh my gosh, this is amazing! i would never think to diy this, so good for you! Very pretty! I like this idea. What an awesome project! This is so genius that it needs to be pinned! Merry Christmas. Very cool idea - thanks for the idea! 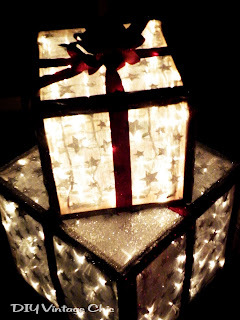 Christmas has ended recently, but I’ll keep this idea and use it next winter. Since the steps seem to be simple, I might improvise and decorate the boxes with designs that have other themes. I just love the photos you posted, and I’m excited to make my own ASAP. Haha! very cute idea...but what can they be weighted down with so they don't blow away in the wind? I actually haven't had an issue with mine blowing away. With the wood frames they're fairly hefty. However if you have some extreme wind, maybe try adding some stakes or using sandbags if it's a concern. you could use eye hook screwed in the bottom and stake them down. what kind of fabric did you use?? They are fabulous by the way!!!!! Can you tell me what kind of fabric was used to wrap around the presents? Yep, as mentioned in the last comment, sheer ribbon on an 18" roll. You can find it at craft stores and I've come across it at Walmart too. my boxes are fantastic,used kreg jig,easy. but as far as the mesh,i find that the lights shine to much through the green mesh,would you suggest green lights. 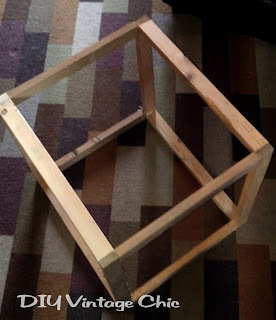 What size were the pieces of wood you used? A jig would work but if you don't have one just use screws. 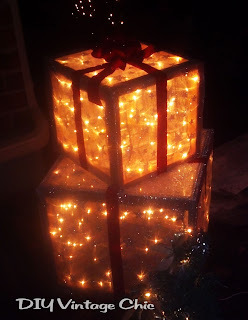 I had these boxes two years ago, just put them out again this year. They've sat through lots of rain and plenty of ice and snow. They're still holding up! Where can I find the wood pieces? How do you make the frames? What kind of fabric? Is that the mesh ribbon that is all around it? Hi Donna - Yes, I used mesh ribbon. You should be able to find it at any craft store, especially during the holiday season. you could probably use any sheer fabric that is heavy enough, even fabric that is not so sheer, as the lights would shine through at night anyway. that way you could use fabric that would look good in the day time too! about how many yds of mesh ribbon was used? I have been thinking about this for a few year. This can be made with PC pipe. Thanks for showing . Nice DIY. I will be making these lighted gifts and put them in front of the house for decoration. It doesn't say how long the lights are? I read where it said she used 3,one hundred count boxes, two for the large one and one for the small. also it doesn't show where to get that clear fabric? Does anyone read the freakin directions?!!!!! 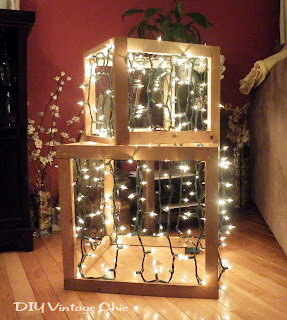 Awesome DIY Projects, I will write about your DIY projects to my Best Kitchen Appliance Reviews blog.